Walbro GSL392 550hp 255lph High Pressure Performance External Fuel Pump & Fitting Kit. These are Genuine Walbro 550hp/255lph High Pressure External / Inline Performance Fuel Pumps, they come with a universal fitting kits that contains all hardware needed. 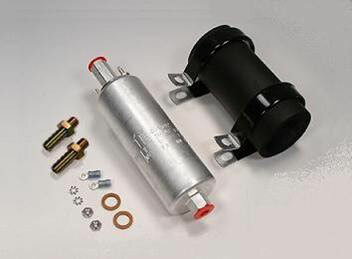 These are one of the most popluar Inline / External Fuel Pumps available on the market today due to their reliability and affordability, the Walbro External / Inline High Pressure Fuel Pumps are used in many aspects of motorsport - drift,track,rally,street, we even sell these to power boats users & aviation applications.